Editor’s Note: The Boston Marathon is scheduled to be run Monday, April 15, 2019. I imagine all runners have their own stories as to what brought them to the competition. But, Jacob Russell and Patrick Dewey’s story is quite remarkable. Take a couple minutes and read Jacob’s telling of it below. “Can’t” is a four letter word. Time, effort and ingenuity have shown that tasks initially declared as “can’t” be done can eventually be achieved. For many people with disabilities “can’t” is a word often associated with competitive sports. 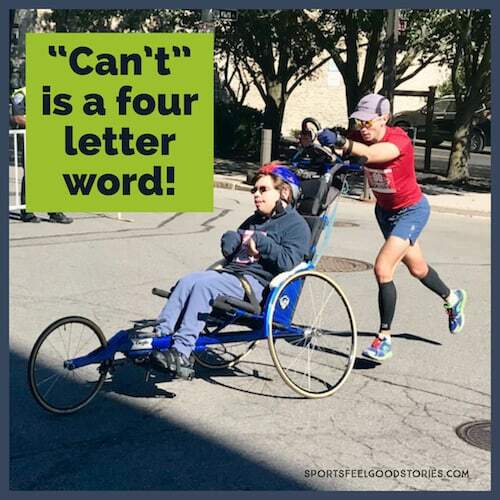 Patrick Dewey and I helped each other change this “can’t” to “can.” Patrick has cerebral palsy and must use a wheelchair for mobility; athletic competition was something that eluded him for years. 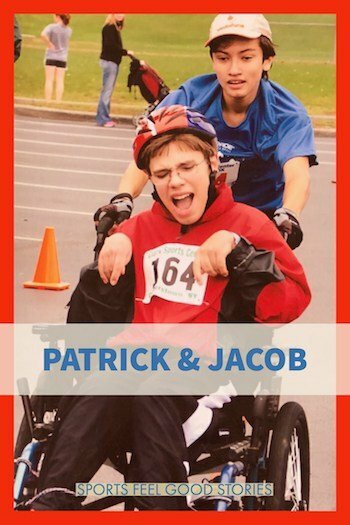 Through our friendship, dedication and love of competition, Patrick and I conquered his physical limitations by competing in duo wheelchair racing. Our lives were forever changed; we learned that perceived limitations can be dismantled and that we can define our own abilities, accomplishments and rewards. I was the smallest boy in my kindergarten class, yet I was chosen first to push Patrick in his wheelchair. At that moment, we formed a connection and bond that continues strong today. Throughout elementary school, Patrick and I found activities we could enjoy together, both in and out of school. 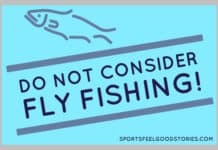 However, as organized sports began to dominate our classmates’ and my free time during middle school, it became more difficult for Patrick and me to do activities together. Fortunately, in eighth grade I discovered the story of Team Hoyt, the dynamic marathon-running duo of a father and his son who suffers from cerebral palsy. As a cross country runner, I envisioned a new way for Patrick and me to compete together (and naively thought “how hard could it be?”). When I proposed the idea to Patrick, his excitement said it all; he could not wait for the opportunity to participate with a friend in an athletic activity. 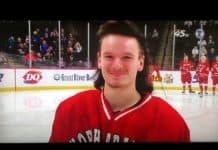 His parents were concerned at first, but given Patrick’s and my enthusiasm they agreed to give us a chance to try a run. Under the supervision of Patrick’s mother beside us on her bicycle, Patrick and I launched our career as a wheelchair duo with simple practice loops around the block. Repurposing Patrick’s bulky, old wheelchair with the addition of bungie cords and straps to keep Patrick secure, we assembled our own rendition of the Team Hoyt wheelchair. In October 2011, we entered a local Cooperstown NY 5k race. Although I had experience running in crowds, the standard wheelchair was not very maneuverable. Thankfully, Patrick quickly realized he could help me by leaning into the turns and providing much-needed encouragement as I struggled pushing his weight up hills. Reaching the final downhill, I thought I was home free, but soon learned that the effort to restrain our momentum and keep the wheelchair from escaping my grip would prove a greater challenge than the uphill battles; Patrick, however, was fearless. As we came into the final stretch and heard cheers, it struck me that this moment was Patrick’s first taste of the thrill of competition with a teammate, the excitement of the homestretch and the cheering of fans. We finished ahead of many of our classmates, and had shown that a disability could not stop Patrick from competing in sports. At that moment of triumph, we could have said we had conquered “can’t” and called it a day; but like any good team, we were not content to rest on our laurels. Throughout high school we became regulars at most local road races, increasing our distances and setting new goals. With the help of our parents, we upgraded to a lightweight racing wheelchair and became more serious competitors in races, sometimes winning our age division outright. In 2015 Patrick and I capped our high school career with our first half-marathon, finishing in two hours. However, our long term goal emerged: running a marathon — and ultimately like Team Hoyt — The Boston Marathon. Attending colleges eight hours away from each other, Patrick and I could have easily drifted apart and put our goal on an endless hold. However, we maintained close contact through weekly phone calls and continued training and racing over breaks. In June 2017, we ran our first marathon in Poughkeepsie, NY in sweltering ninety-degree heat. This experience was a major challenge; no amount of training could have prepared us for the difficulties we faced that day, and how together we would overcome them. At mile twelve, a road bump broke Patrick’s footrest, causing it to drag on the ground in a trail of sparks. Despite my continued efforts to fix the damage, the footrest fell again and again over the next several miles. Racing like this was untenable, but we kept trying. At the mile sixteen water stop, we used duct tape to strap the footrest back to the chair. With the chair cobbled together, I thought the obstacles were over. However, shortly after, all the times I crouched down to fix the footrest caught up with me. Muscle spasms ensued, and with my legs cramping, every stride became unbearable. Patrick realized that I was in pain and began shouting encouragement to motivate me and let me know I was not alone in the battle. This gave me the necessary drive to keep forging ahead; although he did not realize it, I was relying on Patrick to get us to the finish line. We finished in just over four hours, placing fifty-sixth out of one hundred ninety runners. We had achieved our goal of running a marathon and had overcome unexpected bumps in the road, both literal and figurative. Most importantly, we realized that without teamwork, we never would have finished the race. We continued to work towards running the Boston Marathon, though it eluded us in 2018 — the cap of ten wheelchair duos admitted to the race each year delayed our journey. Undeterred, this past September in Rochester, NY we ran our best marathon yet, finishing in 3:44:09 — sixty-fourth out of four hundred. While this time did not automatically qualify us for the Boston Marathon, as the qualification time for duos is the same as that for individuals, we were one of six wheelchair duos selected to run on behalf of a charity in the 2019 Boston Marathon. Next week, we will be achieving our long goal and will have the support of family and friends from home and school. While this will represent the ultimate capstone to our running career, just as importantly we are running for a meaningful cause. It’s the Hole in the Wall Gang Camp, a summer camp for kids dealing with disabilities, whose affiliate Patrick has attended since he was seven. Achieving our goal of running the Boston Marathon on behalf of a great cause encapsulates the essence of our racing: friendship, perseverance and inspiration. Racing with Patrick has shown that success is not merely the shimmer of a blue ribbon but rather achieving something meaningful through shared effort and persistence. And, all the while, embracing the highs and weathering the lows. I have come to understand the true meaning of friendship and trust in one another, and the power it has to drive us to achieve higher goals. From a broad perspective, I hope our racing has changed some minds about the artificial “can’t” often thrust upon those with disabilities. However, on a personal level my journey with Patrick has shown me what we are all capable of. We have the ability to seek out and experience common interests, goals, setbacks and ultimate triumphs with others, no matter what the perceived, insurmountable differences or challenges may be. Jacob Russell and Patrick Dewey are both seniors in college, Jacob studies History and Patrick studies Communications. When they are not racing, they enjoy listening to classic rock together and going for convertible rides around their local lake. NOTE: Support Jacob and Patrick’s fundraising for the Hole in the Wall Gang programs. 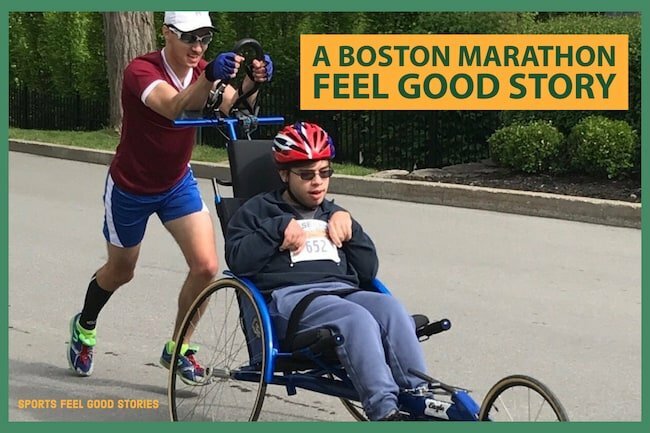 Jacob and Patrick’s Boston Marathon feel good story is a great example of a reader submitted story that we love. We’re always on the lookout for stories like these. You’ll note from Jacob’s story that inspirations like Team Hoyt can influence others to go on to create their own great stories. Please review our “What We Look For In Stories Guidelines” before submitting a story.